Caledonia closed her operational Clyde career by filling in on the Gourock to Tarbet mail service between 1st and 8th October 1969. She was then laid up in Rothesay Dock at Clydebank before being sold for scrap on 11th February 1970 to W H Arnott, Young and Co and moved to their yard at Dalmuir. Fortunately she was not scrapped but lay there for a year and half whilst various attempts, not least by the Scottish Branch of the PSPS, were made to try to find a new future for her. Unfortunately all these efforts failed and it was Tony McGinnity who in the end brokered a deal with Bass Charrington, signed on 23rd November 1971, to buy Caledonia for use as a pub and restaurant on the Thames just upstream of Waterloo Bridge. Tony is one of the great unsung heroes of paddle steamer preservation in the 1960s. As a boy he got to know and fell in love with his local paddle steamer Princess Elizabeth. 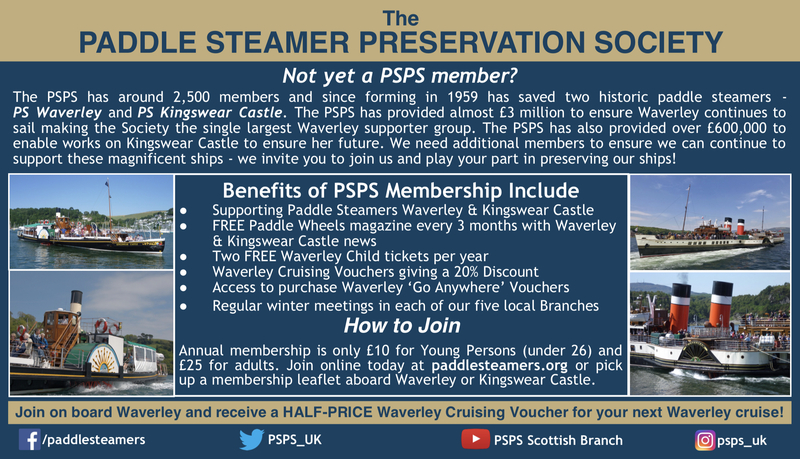 He was a founder member of the Paddle Steamer Preservation Society in 1959 although he took less interest in the society as the decade wore on. It was Tony who pushed for PSPS to buy Alumchine and he was very disappointed when that fell through. It was Tony who pushed to buy Kingswear Castle which was achieved in a sort of way with the ship actually bought in 1967 by Paddle Steam Navigation with a loan - note a loan - of £600 from the PSPS and then only on the basis that somebody else would look after her. It was Tony who bought the Consul in 1963 along with various backers including Mrs Eileen Pritchard, another great unsung hero of paddle steamer preservation from the 1960s. After Consul's failure, Tony set up a ship-broking business in Weymouth and handled nearly all the paddle steamer sales in the 1960s from which he was well placed to work hard to try to find a new future for them. In this he had an uphill struggle as by then paddle steamers were all old and in need of major work and expenditure. However, it was Tony who persuaded Don Rose to buy the Jeanie Deans and it was Tony who worked hard to find a future for the Bristol Queen, Cardif Queen, Ryde and so on and so on. It was Tony who brokered the deal to buy Caledonia. It was Tony who arranged the tow from Greenock, which she left on 2nd January 1972, to the Thames. It was Tony who arranged her conversion for her new static role. And it was Tony who was standing on her new pontoon in the shadow of Waterloo Bridge to welcome her when she arrived on 23rd April 1972. Tony was a tall and imposing man who looked every inch the shipping magnate turned out as he often was in a long blue gabardine mackintosh all of which rather belied the fact that when he bought Consul in 1963 he was just twenty-five years old having recently come ashore after a brief career at sea. He was however a fast learner. He was also a doer and not only a doer but a doer in spades and that put him at odds with some in the paddle steamer enthusiast fraternity. Tony subsequently became a director of P & A Campbell in the 1970s, ran a surveying agency, went into the business of buying, selling and running ships through Havelet Marine Services and in later life specialised in buying and selling tugs. He was a trustee of Foudroyant and oversaw her move to Hartlepool as Trincomalee He saved the drifter Lydia Eva from the scrapyard and steamed her from the West Country to Lowestoft with himself aboard as stoker. He was a Liveryman of the Worshipful Company of Shipwrights, a Freeman of the City of London and was on the board of Heritage Afloat. He died in 2008 whilst undergoing a heart operation in Southampton. It is so sad that Caledonia, which should have been a lasting legacy to Tony's work for paddle steamer preservation, in the end joined most of her other 1960's consorts in the scrapyard after a major fire aboard the ship in 1980. 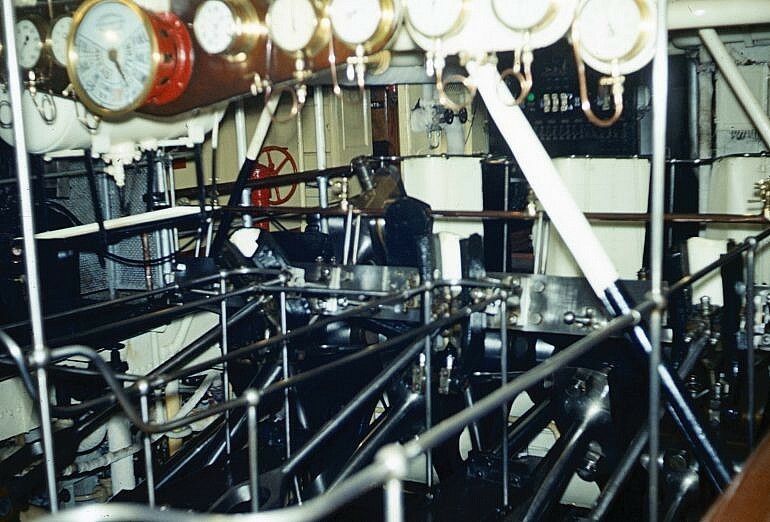 However, her engine lives on at the Hollycombe Steam Collection near Liphook in Hampshire and that at least stems from 23rd November 1971 when Bass Charrington bought the ship in a deal brokered by Tony McGinnity.